“The most precious commodity possessed by a wise man is free time.” This sentence written by the German playwright Paul Ernst appears in his “Diary of a Poet”. So, what do people do with their free time after finishing work for the day? Today, the entertainment industry offers us more possibilities than ever before to fill our leisure time: Books, music, films and games, which are available any time, any place thanks to the wonders of digitization. 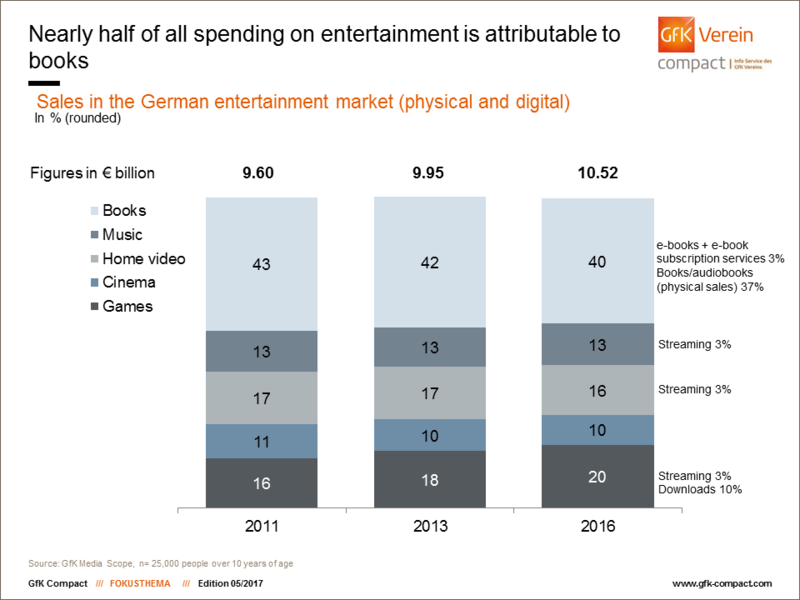 Germans are above all fans of literature when it comes to entertaining themselves – books account for the largest proportion of entertainment market sales. But things are happening in the music business too: With sales well on the up, good old vinyl is on the comeback trail! Waking up to your favorite music in the morning, killing time on the subway with online games or enjoying a good book or film while curled up on the sofa in the evenings: When it comes to entertainment, the possibilities are endless! Germans are willing to shell out for this variety. Last year, they spent a total of €10.5 billion on books, music, films and games. 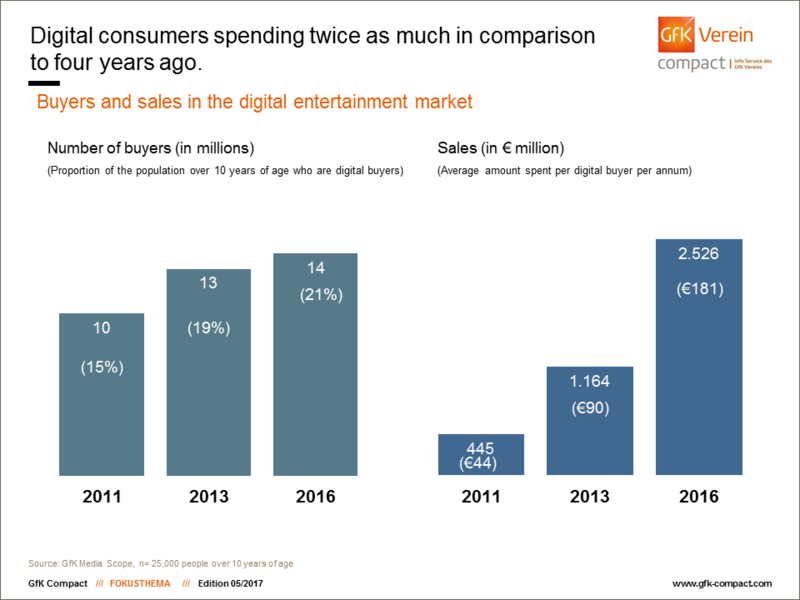 The entertainment market therefore grew yet again: In 2011, total sales amounted to €9.6 billion, while in 2013 the total came to just under €10 billion. 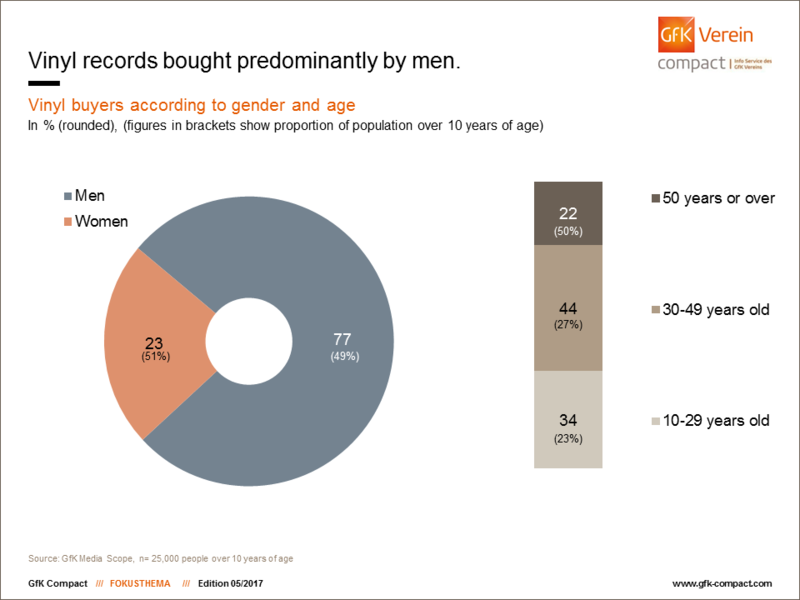 These figures are obtained by the GfK Media*Scope consumer panel. Around 25,000 people report regularly on their purchases of books, digital games, cinema tickets, etc., as part of this panel. Both physical sales and purchases of digital products are included in the figures. The figures show that Germans have been particularly willing to part with their hard-earned cash for both books and audio books for years now. Nearly half of their overall entertainment budget (40% in concrete terms) was invested in literature during 2016. The sales share of books has therefore fallen slightly across the past few years. In 2011, it was still 43%. However, does this mean that the end is nigh for the book? Absolutely not. In real terms, consumers actually spent slightly more on books in 2016 than in 2013. Is this possibly down to new digital offerings on the entertainment market? Not for literature, at any rate. Rising prices are mainly playing a role in this development, allowing the market to grow despite falling buyer numbers. Only around 3% of overall expenditure was attributable to e-books or e-book subscriptions. It seems that consumers are, as before, more at home with a traditional printed book or audio book. When they aren’t making their way through huge tomes or listening to their favorite crime thriller, German consumers like to relax by playing games, among other things. Games account for 20% of sales, with digital variants performing particularly strongly. Nearly two-thirds of the entire consumer games budget goes on downloads, micro-transactions (virtual credit and additional content), subscriptions as well as fees for online networks (e.g. PlayStation Plus and Xbox Live Gold). In the music category, the high streaming share of 3% of the overall 13% (nearly a quarter of the whole music budget) was behind the increase in sales. The film industry secured another slice of the cake: Here, 16% of sales were attributable to home videos, with cinema ticket sales accounting for 10%. The home video segment also strongly benefited from the streaming trend. Services such as Netflix, Amazon, etc., have meanwhile been able to secure nearly one-fifth of sales (3% from the total of 16%). What “entertainment type” are you? Are you someone who prefers to hold a real book in their hands when reading and listen to music and audio books on CDs? Or perhaps you are one of those who are more comfortable with a tablet, deciding whether to power up an e-reader or watch a recently downloaded video as the mood takes you. If the latter applies, then you a part of a group which has been steadily rising for years. In 2016, a total of 14 million people downloaded music, books and films onto their end device such as a laptop or tablet. Five years previously, this figure was just 10 million. The proportion of digital consumers among the overall population has therefore risen to around 20%. In this respect, total expenditure for digital goods has grown more than fivefold since 2011 – from barely €0.5 billion to €2.5 billion in 2016. According to the latest statistics, every consumer spends €181 on digital music, books, films and games. In 2011, the annual digital budget was just a fraction of this amount, at €44. US$ 300,000. That is the figure paid by a collector two years ago for the first Elvis Presley vinyl record, as reported by “Spiegel online” among others. Such a financial outlay is admittedly something quite extraordinary and requires not only deep pockets but also a huge affinity for music, a particular artist and that special vinyl feeling. However, people with smaller budgets also seem to be developing a taste for good old vinyl. 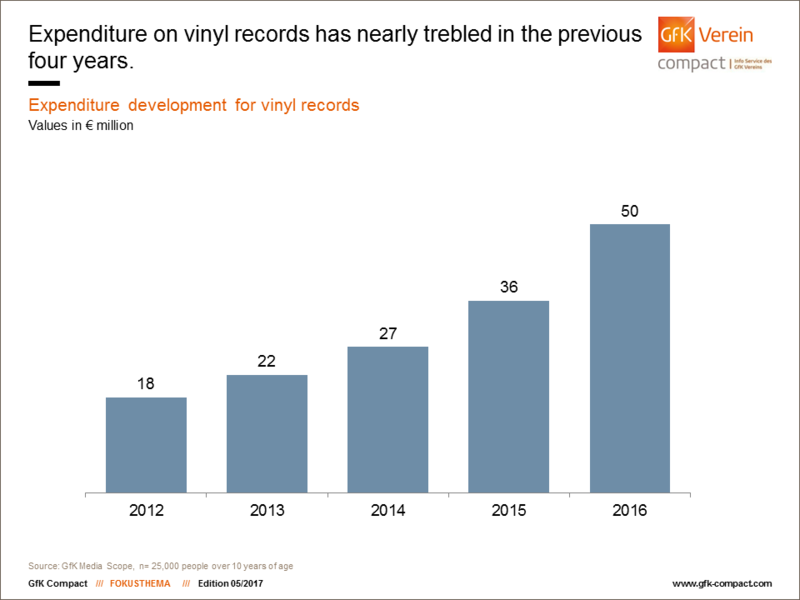 Expenditure on vinyl records has been rising steadily for years. In 2012, consumers spent €18 million on vinyl; by 2016, this figure had already risen to €50m, very nearly three times as high. A fuller, warmer sound, the joy to be found in old technology and that haptic pleasure – whatever the reasons for the comeback of vinyl might be, one thing is for sure: It is above all men who are responsible for soaring sales figures! More than three-quarters – a clear majority – of all vinyl purchases are made by men. Women account for just 23% of these. Why is this the case? Well, perhaps female music aficionados are simply more pragmatic? Maybe they do without sound systems which they have to clean and could easily scratch, opting instead for other options which can be maintained much more easily? One thing is for sure: It is not only nostalgic older consumers who are driving sales, as is shown by a look at the individual age groups. In fact, the opposite applies: It is above all 30-49 year-olds who are responsible for vinyl purchases. Although they only account for around a quarter of the overall population, this age group was responsible for 44% of vinyl purchases last year. One third of vinyl sales were attributable to 10-29 year-olds (23% of the total population). And just 22% of vinyl buyers were people aged 50 and over – despite the fact that this age group still accounts for nearly half of the total population. Hipsters and millennials are seemingly in the grip of vinyl fever! It remains to be seen whether, one day, CDs and MP3s can attain a similar cult status to that enjoyed by vinyl. Already today, some are predicting their imminent decline – although these prophecies of doom above all hail from users of music streaming sites. However, their prediction is not totally unfounded. Ever more consumers are making the conscious decision to not own music, but rather use it for only a certain period of time. A new trend is emerging on the entertainment market which could really shake things up in the medium term. Who knows, perhaps in 80 years’ time we will be sitting in front of our smartphones with a sense of nostalgia as we listen to music via one of these retro streaming devices? Simply because it sounds so much better! If you have any queries, please contact Claudia Gaspar (claudia.gaspar@gfk-verein.org) or Bianca Corcoran-Schliemann (bianca.corcoran-schliemann@gfk.com). Would you like to be informed as soon as a new Focustopic is released? Please provide your email address here to sign up for notifications.